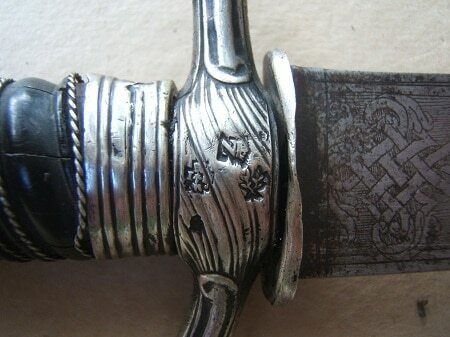 A VERY GOOD+ REVOLUTIONARY WAR PERIOD FRENCH SILVER & EBONY HILT CUTTOE, HALLMARKED 1763: French-made, fine quality, etched and engraved, single edge, hollow-ground, Parisian made, cuttoe-type, 22 1/2″, blade with a single fluted fuller extending from the ricasso to the clip-type point. 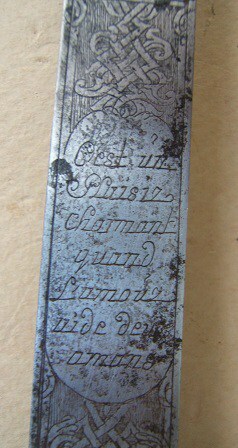 Very good smooth surfaces with 75% polish and sharp edges: engraved, on the both sides (one side slightly worn/discolored) with a “Cest un Luisiz charmant quand L’amouz aide deu amans” engraving. 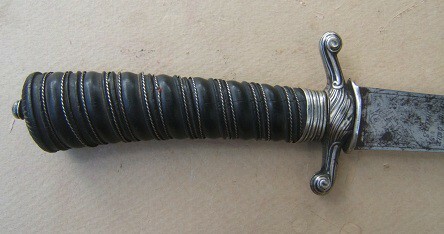 Spiral carved Ebony grip/hilt with deeply embossed Hallmarked Silver fittings. 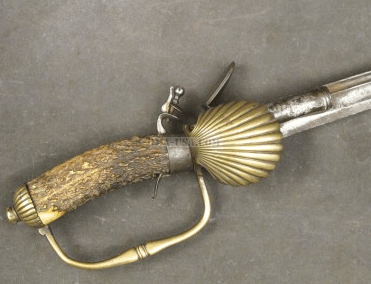 An “S”-shaped cross-guard with rounded quillons, a ring type grip-ferrule and a disk-type pommel: the center of the cross-guard with deeply struck Parisian Silver Hallmarks, for 1763. In overall very good+ near fine untouched condition. The blade with smooth surfaces with lightly tone age-patina, some scattered patches of discoloration and light surface-pitting. Very good grip with its braided silver grip-wire and some minor signs of use and age. Retains 75% polish with its sharp cutting edge and fine quality etchings. 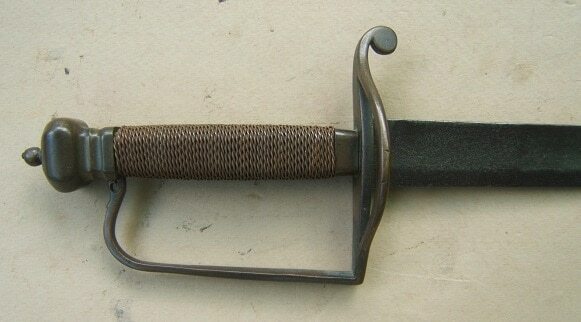 A very nice example of an American Revolutionary War Period French/Parisian Silver Mounted Ebony Hilt Cuttoe, dtd. 1763. Overall length, 28″. For similar examples please see G. C. Neumann’s “Swords & Blades of the American Revolution”.